We joined the British Heart Foundation to create two 360 videos which were designed to help people through the experience of an angioplasty or angiogram, two of the most common procedures associated with the heart. 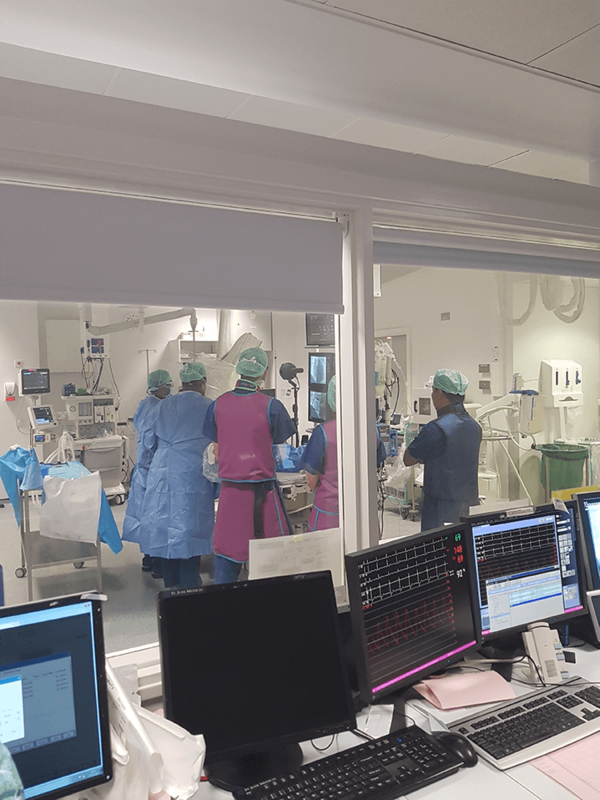 Filming with patients at the John Radcliffe Hospital in Oxford, our task was to produce a 360 video of a live angioplasty and a 360 video introducing patients to a catheter lab and its staff. The biggest challenge we faced with this 360 video was that we needed to film with real patients and we had very little idea of who would come in with what condition. Not every patients needs a full angioplasty, with a stent insertion, but unfortunately we weren’t able to cherry pick our patients. So we had to fit in with a normal schedule at the hospital. Our chosen approach was to film every procedure and then to select the most appropriate footage once the day was out. This meant for a long day, but ultimately we got great footage of a man needing a full angioplasty and stent insertion. The Nokia OZO in position between the X-ray monitors on the bed. A live angiogram is filmed on the Nokia OZO. As we were filming patients having actual procedures we couldn’t afford to have the camera fail at any point. Therefore we chose the Nokia Ozo and an external 4K recorder, as combined they provided the stability and the longevity we needed - some procedures lasted over an hour and once begun the crew had no access to the camera inside the catheter lab. The camera was placed in between the patient and the X-ray monitors above the the bed, which gave our viewers the perfect vantage point, whilst not interfering with the hospital staff and their work. Many potential patients get nervous about having an angiogram or angioplasty so our second 360 video was designed to set them more at ease by introducing them to the catheter lab and the staff. This was filmed in the catheter lab surrounded by the equipment and the various team members. The videos were shared on YouTube and the British Heart Foundation online magazine, Heart Matters. They were effective as flat screen 360 videos but also as headset VR experiences, either through Google Cardboard or Samsung Gear VR. The videos came complete with 360 spatial sound meaning that when watched in a headset the immersion was complete, or when watched on a phone or a computer the sound provided guidance as to look at any particular time. We added intuitive graphics to further help guide our viewers through the experience. Safe from the harmful radiation from the constant X-rays, Andrew watches the live angioplasty from the live stitch on the wireless monitor. The Hyperdeck, 17” monitor and live stitch set up which allowed us to film multiple procedures without interruption.